This is about philosophy or ways of thinking and food for thought. If you're happy with your life the way it is, this book is probably a waste of time for you. Hi there, welcome to this Web page. But if you are somebody who is looking for answers to questions and you like to expand your perspective, it's right for you. 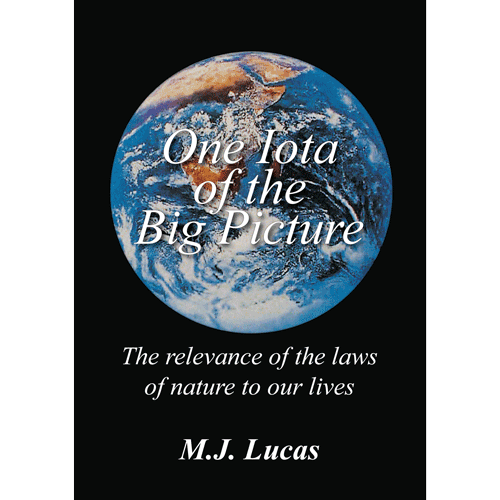 From the origin of our universe to the structure of our societies, from ancient civilizations to the blue print of human beings, from our life support system to globalisation, it explains how everything is based on the same 5 basic laws of nature and their relevance to our lives as human beings. It provides answers to the questions why we are doing this and that, how the human mind works and where the mental mistakes are and how to get rid of hem. As a focal point it explains a way of thinking, which is based on the laws of nature, instead of our self-made rules and because of this can lead to an attitude of live and let live and with that a happier and more balanced life. It provokes many thoughts and touches many subjects. No matter who you are, or what you're doing, you'll find something in it for you. I hope you enjoy the reading, have a nice day, M.J.Lucas.